How many times have you been told that if only you improved your running form, you’d be a better, more efficient runner? A 2018 study by Brian Hanley and Catherine B. Tucker out of Leeds Beckett University has revealed that a little asymmetry in your stride might not be an abnormal or bad thing. Hanley and Tucker examined 14 competitive runners while running for 10,000m at speeds equivalent to 103 per cent of their season’s best time. Researchers looked at the runner’s strides at 1,500m, 3,000m, 5,000m, 7,500m, and 9,500m. RELATED: Could improving your running form actually make you a less efficient runner? The athletes tested were elite runners, and presumably their strides were fairly efficient. While a major or recurring injury could be an indication of a form issue, a slightly asymmetrical running gait that isn’t causing any problems likely is not. 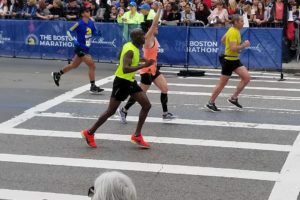 This is further supported by the idea that with prolonged running and training, the body will naturally adopt the most efficient form for that particular individual and that there is indeed no proper or perfect running form for all.